Provide comfort for the family of Wade Credeur with a meaningful gesture of sympathy. Funeral Services will be held on Thursday, February 7, 2019 at 2:00 P.M. in the Duhon Funeral Home Chapel in Rayne for Wade T. Credeur, 50, who passed away on Sunday, February 3, 2019 at 11:44 A.M. at Lafayette General Hospital in Lafayette. Pastor Berl Adams, Pastor of the First Baptist Church in Church Point will be officiating for the services. Burial will be held in the St. Theresa Catholic Church Cemetery in Duson. The family has requested the visitation to be held on Thursday at 9:30 A.M. until time of services all in the Funeral Home Chapel in Rayne. Survivors include his mother, Evelyn T. Credeur of Duson; two sisters, Rachel and husband, Steven Prejean of Scott, Roxanne and husband, Chip Haw of Youngsville; one niece, Gabrielle Haw of Youngsville; two nephews, Caleb and Zachary Prejean both of Scott. Wade was preceded in death by his father, Joseph Clifton Credeur; his paternal grandparents, Arvillien and Doris Cormier Credeur; his maternal grandparents, Thomas and Nedia Stelly Thibodeaux; several aunts, uncles and cousins. Pallbearers for the services will be friends and family members. In lieu of flowers the family has asked to please make a donation to the American Kidney Fund. The family would like to send a heartfelt thank you to the Doctors and Staff of Lafayette General Hospital, Louisiana Extended Care, 6th floor, the Fresenius Kidney Care and Davita for all their help and support. 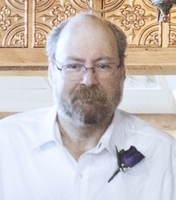 You may view the obituary, sign the guest registry and express condolences online to Mr. Credeur’s family at www.duhonfuneralhome.com. Duhon Funeral Home-Rayne, (337) 334-3600, 900 East Texas Ave., Rayne, LA 70578 is in charge of all of the arrangements. We encourage you to share your most beloved memories of Wade here, so that the family and other loved ones can always see it. You can upload cherished photographs, or share your favorite stories, and can even comment on those shared by others. Rachel, please know that our thoughts are prayers are with you and your family. The memories of my time at Nortel would be incomplete without thinking of you Wade. Take care my friend.